Exploring regional American foodways, one Junior League cookbook at a time. My cousin Tracy recently gave me a copy of the Junior League of Gaston County, North Carolina‘s Southern Elegance (1987), so I decided to leaf through it and see if I could find a good Christmas cookie or two. Linzer Hearts, those pretty little cut-out cookies that usually have a little picture frame top with raspberry jam inside, caught my eye. 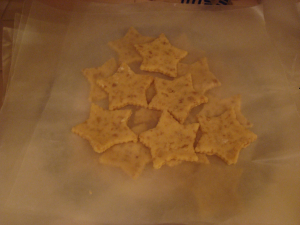 However, I decided to make them with more seasonally festive star cookie cutters. I thought it would be easy. I thought it would be fast. I was so wrong. Cream butter and 1 cup of the sugar until light and fluffy. Add egg and mix well. Sift together the flour and cornstarch; add to creamed mixture and blend well. Mix walnuts in thoroughly. Gather dough into a ball. Wrap in plastic wrap and chill for 4 to 6 hours or overnight. On a well-floured surface roll dough out to 1/4-inch thickness. Using a small heart-shaped cookie cutter about 1 1/2 inches long, cut out cookies and place on a cookie sheet lined with parchment paper. Chill cookies for 45 minutes. If you're short on room in the fridge, you can chill the cookies between layers of waxed paper. Preheat oven to 325 degrees. Bake cookies for 10 to 15 minutes or until they are very lightly browned around the edges. 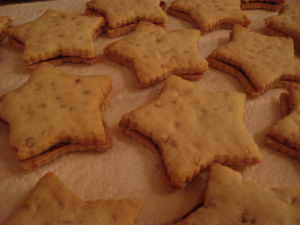 While they are still warm, spread half of the cookies with raspberry preserves, using 1/4 teaspoon jam for each. Top each with one of the remaining cookies. Sift the remaining 3/4 cups powdered sugar into a bowl and press tops, bottoms, and sides of the cookies into sugar to cool. While these are a delightful, yummy, pretty special occasion cookie, they are not the kind of cookies you pull out for a passing acquaintance. In fact, they are probably not even the kind of cookies that you allow your loved ones to casually munch on around the house. These are cookies to be cherished, rationed, and hoarded. That’s what Christmas is about, right? Hoarding? It’s not that the cookies are exactly difficult. The dough mixes up in no time, the baking is a no-brainer, and the assembly is pretty self-explanatory. Rolling out the dough is another matter entirely. Because it is comprised almost entirely of butter, you have a very small window of opportunity to get it rolled out, cut, and back on the plate before it turns into a sticky mess that refuses to do anything except stick to the counter. So, after you cut out a batch of cookies, you’ll have to gather up the scraps, ball them up, wrap them back in waxed paper, and stick them back in the fridge for at least 20 minutes before you can roll them out again. This gets… time-consuming.